Botrytis on spent tomato plants. 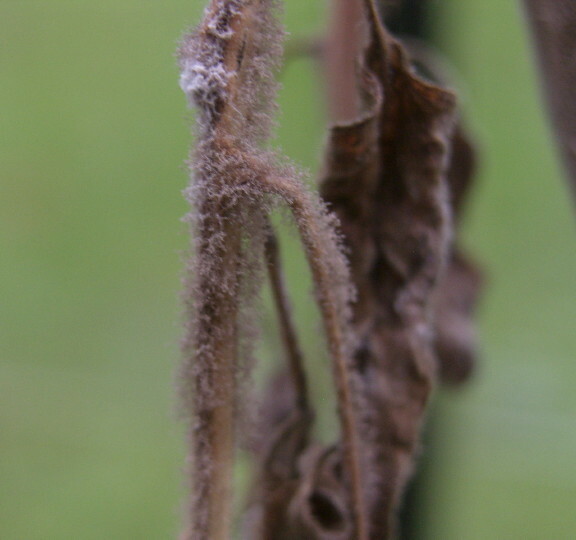 Grey mould, or Botrytis, forms a dense grey-brown fungal mass affecting leaves, stems, flowers and fruit of most plants if the conditions are right, also stored fruit and vegetables can be destroyed. Spores are around all the time and are air-borne or in water splashes, requiring the nutrients from wounded tissue for entry and humid, cool conditions with still air to grow. Infection can occour between 3 and 25°C. Relative humidity above 95% at 10-20°C for over 3 hours will cause the spores to germinate. Affected plants wilt and die back. Whole lettuce plants can be affected and rot off at the base. It first appears as yellow spots on tomato shoots and fruit. Chrysanthemums develop purple spots on their leaves and mummified flower buds. Any attack is at the least disfiguring so prevention is best. As the infection matures black sclerotia (resting bodies) about 2mm accross are produced. These can survive for long periods in affected plant tissue so can re-infect nearby plants. Fallen leaves, flowers and fruit can be infected, releasing spores which transfer to growing tissues nearby. 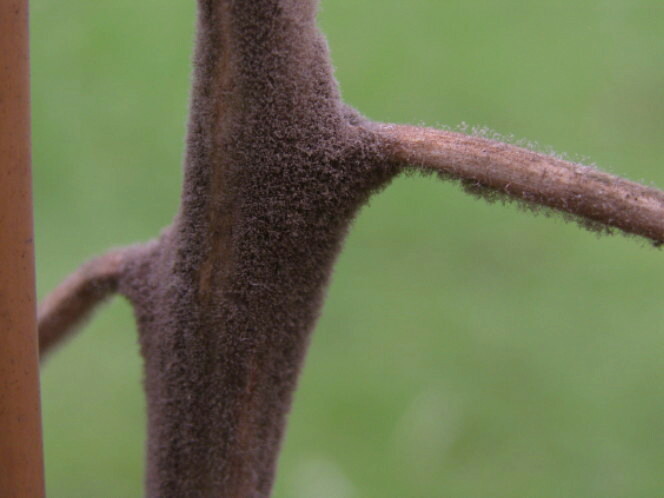 Touching an infected leaf, bud or fruit releases a cloud of spores. The many long hyphae (condispores) with branching forming the fungal growth. Good hygiene by removing pant debris from beds and plant separation to improve air flow, helps prevent attack. Use sharp tools when pruning to make clean cuts and avoid damaging plants. In the greenhouse ensure good ventilation and control of humidity to prevent dew formation at night. Avoid overhead watering, especially after pruning, and watering indoor crops early should mean the foliage is dry by night-time. Feeding with high nitrogen produces soft growth which is more prone to attack Removal of any infected material is essential. Some protective fungicides may be used according to manufacturers instructions, but good hygiene is the best method of control.